Assigning a value to a variable seems straightforward enough; you simply assign the stuff on the right side of the '= 'to the variable on the left. Below statement 1 assigning value 10 to variable x and statement 2 is creating String object called name and assigning value "Amit" to it. Assignment can be of various types. Let’s discuss each in detail. The equal (=) sign is used for assigning a value to a variable. We can assign a primitive variable using a literal or the result of an expression. Casting lets you convert primitive values from one type to another. We need to provide casting when we are trying to assign higher precision primitive to lower precision primitive for example If we try to assign int variable (which is in the range of byte variable) to byte variable then the compiler will throw an exception called "possible loss of precision". Eclipse IDE will suggest the solution as well as shown below. To avoid such problem we should use type casting which will instruct compiler for type conversion. For cases where we try to assign smaller container variable to larger container variables we do not need of explicit casting. The compiler will take care of those type conversions. For example, we can assign byte variable or short variable to an int without any explicit casting. You can also assign null to an object reference variable, which simply means the variable is not referring to any object. The below statement creates space for the Employee reference variable (the bit holder for a reference value) but doesn't create an actual Employee object. Assigning a value to can be straight forward or casting. If we assign the value which is out of range of variable type then 2’s complement is assigned. 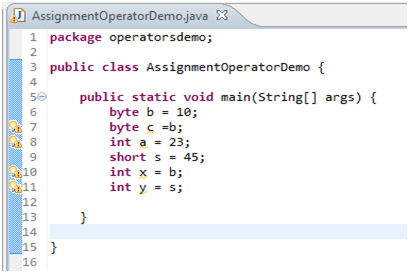 Java supports shortcut/compound assignment operator.